Roy had won a bowfishing trip I donated to the United Bowhunters of Connecticut. I extended an invite to Roy's son as well. While it was not Roy's first time bowfishing, it was Robie's. They had a blast, shooting half a bucket full of common carp in 5 hours of bowfishing. Hunt 2 - CT River with Matthew and Patrick Lefemine Jr.
My second trip of the season was reserved for my two sons, Matt (6) and Pat Jr. (8). Matt is a little too young to bowfish but he made a great spotter for his older brother who was able to bowfish with his new BuckMasters compound. This time I brought another father and son out to enjoy some great bowfishing action. I had introduced Justin to bowfishing last year when he was 11. With the spawn approaching, we had some good action on the river this evening. Mark Land from Muzzy invited me down to LA and MS for some hard-core bowhunting action. On this trip we were fishing for Gator Gar, Redfish, Drum, Sheepshead and spotted gar. As a diversion to our LA Marsh trip Mark Land, John Schneider and I headed up to bowfish stingrays off of Cat Island in Mississippi. 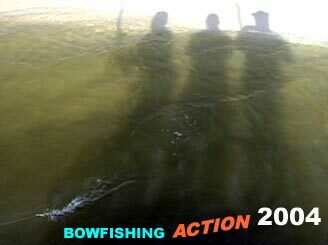 Visit Muzzy.com for all of your bowfishing gear!